We’re into the final countdown. In just over 48 hours, Seattle and Denver will take to the field to hustle for the NFL’s top prize. Here is one more idea for your football feast. Like wings, chicken strips (a.k.a. 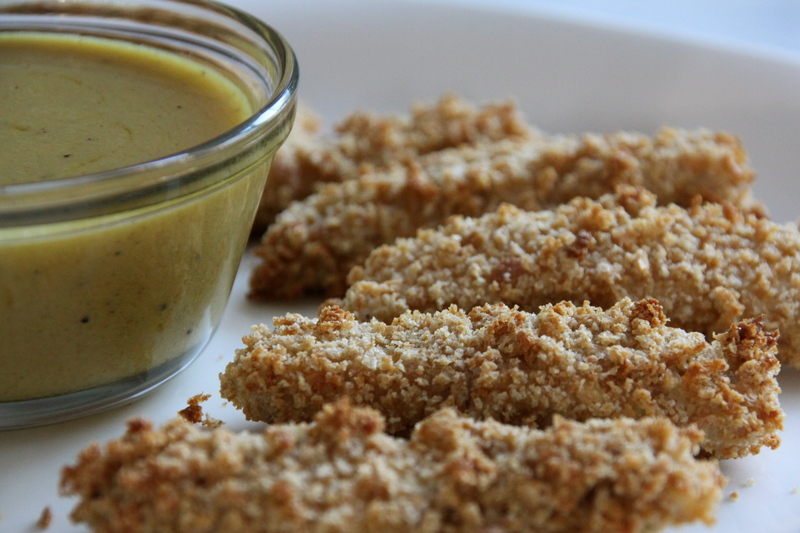 tenders, fingers, fillets) are a classic game day snack. They’re quick to make, tasty, and a crowd pleaser. What really makes chicken strips a hit is the dipping sauce. There’s the ever-popular ketchup, the basic BBQ, or maybe you prefer mayonnaise. In honour of Jon Ryan, the lone Canadian player in Sunday’s game, Rebecca, our YVF Kitchen Super Sauce expert, shares the recipe for her Canadian maple-inspired dipping sauce. If using scallopini, cut into even-sized strips. Combine salt, pepper, garlic powder, mustard powder and sugar in a bag. Toss with chicken strips to coat. Prepare breading station in three bowls: set up flour in bowl one, lightly beaten eggs in bowl two, and spelt crumbs in bowl three. Dip chicken strips one at a time into flour, shaking off any excess, then into egg, then into the bread crumbs to coat. Bake on parchment paper–lined baking sheet for 15-18 minutes until coating is lightly golden and chicken is fully cooked (internal temperature should reach 165F/74C). Serve alongside your favourite selection of sauces. Pour all ingredients into a small mixing bowl and whisk together until fully combined. Serve alongside warm chicken strips. This entry was posted in Blog, Recipes and tagged #GameDayGrub, #YVFkitchen, dip, Jon Ryan, maple, Super Bowl. Bookmark the permalink.